Last month, I was thrilled to be invited to join Prahran Market's A-Team, a group of food bloggers who are given a mystery bag of seasonal produce and asked to come up with some creative recipes. As I mentioned in my post on Apple Crumble Pie, I hadn't been cooking much, so it was lovely to have a reason to get back into the kitchen and flex my creative muscles. One of the more mysterious ingredients in my mystery bag was dried Inca berries. I hadn't bought inca berries before, but these wrinkly little dried fruits are a type of physalis from South American that are apparently full of good nutrients. They have a unique flavour, being both sweet and tart, and have a nice chew to them. 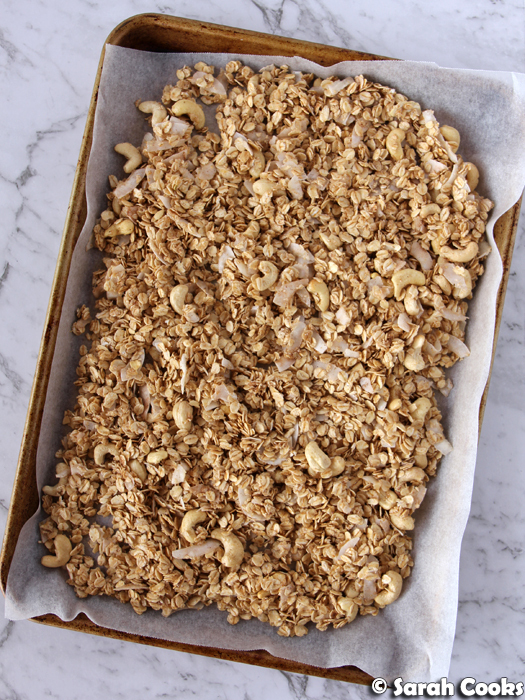 They are a good snacking fruit, but I was here to create recipes, and I thought they'd go perfectly in a batch of granola. I always love having a batch of granola on hand to top smoothie bowls or yogurt for breakfasts, or for general snacking purposes. Let's take a look! For me, oats are non negotiable as the base of granola - I love them! 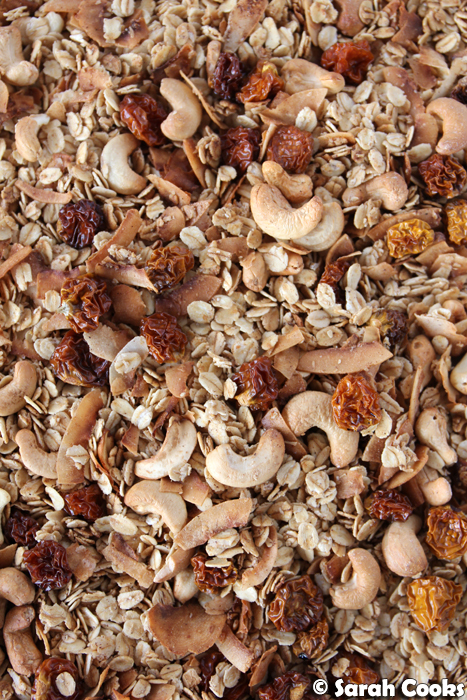 To match the South American vibe of the Inca berries, I gave my granola tropical flavours, with coconut flakes and cashews. I used coconut oil as the binding oil, which echoes the flavour of the lovely coconut flakes. A little maple syrup adds sweetness and smokiness, while helping to bind all the dry ingredients together. I added warmth and spice with cinnamon and ginger, and some sea salt flakes to enhance the flavours. It's just a matter of melting the coconut oil and stirring everything together. (Apart from the Inca berries; those get stirred in after cooking). This smelled so good as it was baking - the combo of spices and oats and coconut legit made it smell like Anzac biscuits! It only takes about twenty minutes in the oven, with a couple of stirs during cooking. Do keep an eye on it, as the coconut flakes can burn quite quickly. 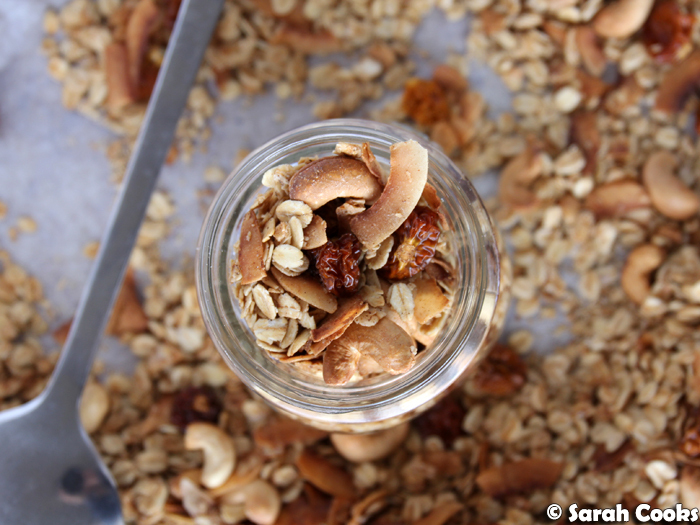 The granola also gets more crisp as it cools down, so don't worry about cooking it until crisp; just take it out when it's the colour you like. Stir the Inca berries through, and you're done! Let it cool completely, eat a few handfuls "for quality testing purposes", keep it in an airtight container, and enjoy! 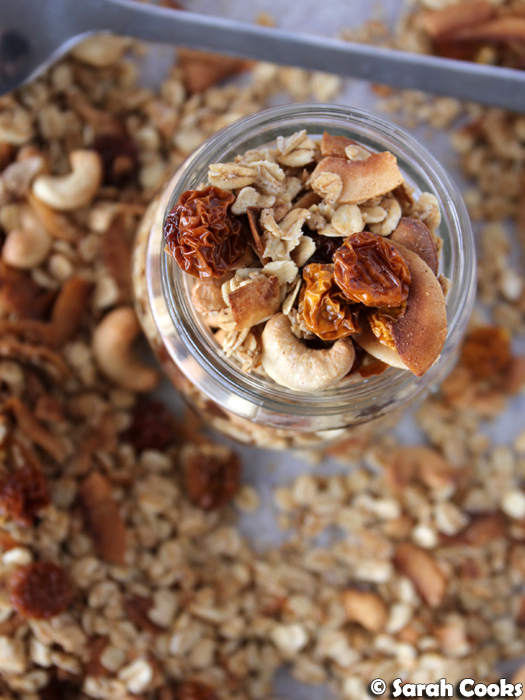 Inca berries can be a little tricky to find (although they're obviously available at Prahran Market, duh, at the 53 Degrees East store), but if you can't get your hands on them this granola is definitely still worth making. Try substituting dried cranberries, or even chopped dried pineapple. Any dried fruit with a hint of tartness would work well. I've been loving this granola with coconut yogurt and fresh fruit. Super delicious! Melt the maple syrup and coconut oil together in a small saucepan or in the microwave. Set aside. 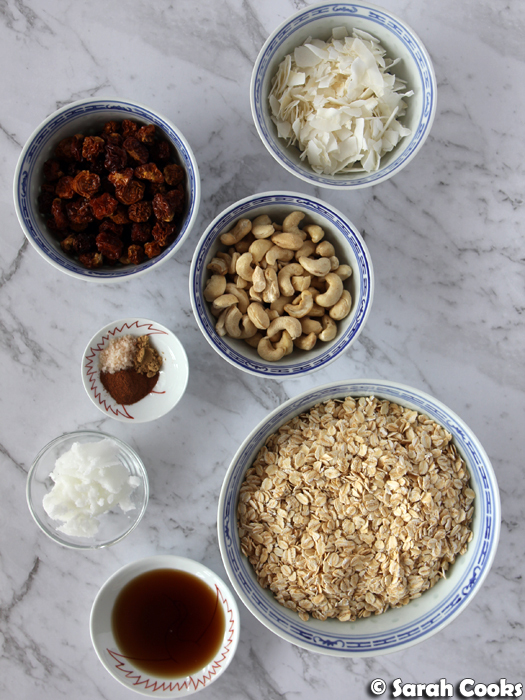 Stir together the rolled oats, coconut flakes, cashews, ground cinnamon, ground ginger and sea salt flakes. Pour in the melted coconut oil and maple syrup and stir gently until well combined. Spread the mixture out onto a lined baking tray and bake for 20 minutes, or until golden brown, stirring the mixture halfway. Allow to cool, then stir in the inca berries and store in an airtight container. Sarah received complimentary Inca berries from Prahran Market as part of her participation in the A-Team. See Prahran Market's blogpost for all the recipes, including some lovely ones from Jo from Second Helping! I had a bag of these and used them in a chocolate recipe. They are nice and quite sour!